Assateague Island Lighthouse is a seacoast light within the Chincoteague National Wildlife Refuge in Virginia. The lighthouse was first completed in 1833, but was later found to be inadequate. The onset of the Civil War delayed funds to raise the tower, but the project was later completed in 1867. 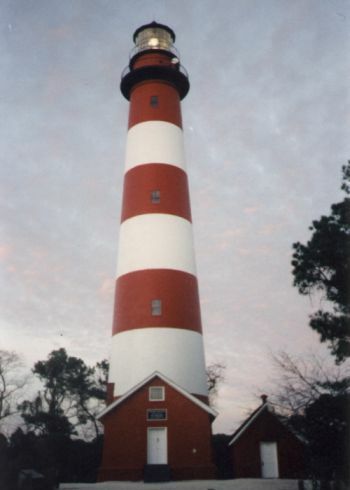 Assateague Island Lighthouse now stands 142 feet tall with alternating red and white horizontal stripes. The lighthouse surroundings are quite serene with nature flourishing. Ducks, geese, deer, and even the famous ponies of Chincoteague share this beautiful refuge with the Assateague Island Light. The U.S. Coast Guard currently owns and operates the lighthouse.